Also see the Headset entry in my Bicycle Glossary and my Article on Handlebar Height. The "headset" is the bearing assembly that connects the front fork to the frame, and permits the fork to turn for steering and balancing. The crown race is pressed on to the bottom of the steerer, just above the crown. "Pressed" means that the parts are attached using an interference fit between cylindrical surfaces. The inside diameter of the outer part (head tube, crown race), is very slightly smaller than the outer diameter of the part which mates with it (head race, fork crown race seat). Force must be used to assemble (or disassemble) them. When assembled, they act as a single part. Some newer headsets have slip-fit parts instead --- more about that later. There are two common headset types: threaded and threadless. Traditional threaded headsets fit forks with threaded steerers. 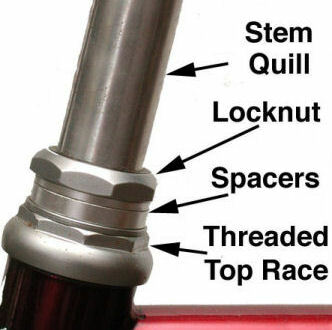 The top race screws onto the steerer, and a locknut screws on after it to secure it. There is normally a keyed washer between the top race and the locknut for extra security. In addition to the keyed washer, there may also be one or more spacer washers. One of them may be extended forward to serve as the cable housing stop for a centerpull or cantilever brake or the mounting for a headlight. 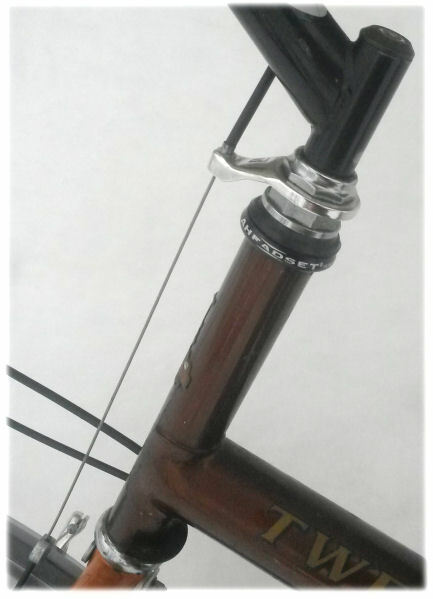 Threadless headsets used on many newer bikes (since the 1990s) fit forks with unthreaded steerers and use a clamp or collar to secure the top race. Usually, the handlebar stem does double duty as this clamp or collar. The nominal size of all headsets is based on the outside diameter of the fork steerer. This is a source of confusion, because the steerer is not visible on an assembled bicycle. The steerer is enclosed inside the frame's head tube. In the case of a bicycle with a traditional quill/expander/wedge type stem, the stem shaft will be 1/8" smaller than the steerer. Sometimes people measure the stem diameter and assume, incorrectly, that this is the size headset they have. Other dimensions also matter when selecting a replacement headset. Outside diameter of the frame cups where they press fit into the top and bottom of the bicycle's head tube. Crown race inside diameter, where the crown race is press fit onto the fork crown. Thread pitch, for threaded headsets. Stack height. 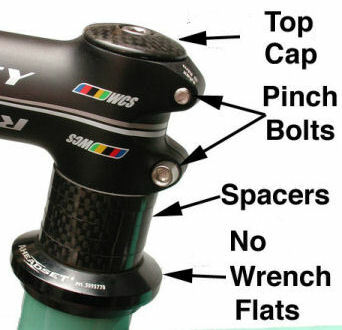 If the new headset is shorter, its height can be increased using spacer washers, but if the new headset is too tall, parts will extend past the top of the steerer, preventing proper assembly. There also are variations in the depth and shape of the sockets at the top and bottom of the head tube for the upper and lower head-tube races -- "standard", "integrated," "semi-integrated", "low profile". The integrated and semi-integrated headsets have a larger-diameter head tube with cartridge bearings recessed into it. Unless you are very sure about all of these dimensions, take the old headset and/or the frame and fork with you when you go to buy a new headset. Common dimensions are shown in the tables below. Better bike shops can mill a fork of most frames for a smaller crown-race press-fit diameter. New bicycle designs and the increasing popularity of cartridge bearings have led to several new headset dimensional standards. The Standardized Headset Identification System (SHIS) has been developed by manufacturers to identify each of the dimensions that affect the fit of a headset to the bicycle frame and fork, using a compact code. The SHIS code works for headsets in common use today. It fails for a couple of older threaded headset standards which have dimensions a fraction of a millimeter different from current standards, but these are rare. The first two letters of the code ("ZS" in the example) describe the headset assembly type. This can be different for the top and bottom assemblies. EC (external cup) -- the traditional pressed headset, which may be either threaded or threadless. 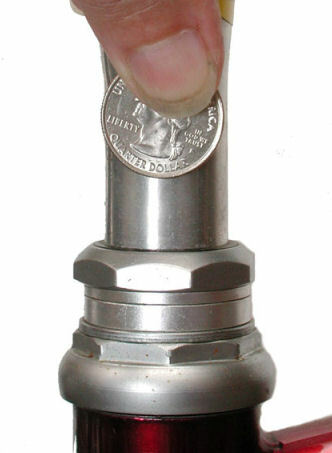 IS (integrated) -- a cartridge bearing is inserted directly into a recess in the head tube. There are no bearing cups. The recess is a slip fit and the bearing is aligned by the tapered bottom of the recess. External-cup (EC) lower headset. Semi-integrated (ZS) top headset -- note gap between bearing cup and cone just above the head tube. Integrated (IS) headset, top and bottom. The bearing cone sits directly above the top of the head tube. No visible lower-headset parts. For a Japan Industrial Standard (J.I.S.) headset with a 30.0mm frame cup outside diameter, the head tube inner diameter is 29.9mm and so the code is EC29. For a semi-integrated headset with a 44 mm frame cup outside diameter at the top and 56mm at the bottom, the code for the top is ZS44 and for the bottom, ZS56. The old Italian standard used a 26.5mm crown race, so the rounding could lead to some confusion -- but the Italian standard is obsolete, and an Italian fork can be milled down to 26.4 to take a modern ISO headset. A threadless top race is slip fit onto the fork steerer. Even in an integrated headset whose cartridge bearings slip-fit directly into the head tube, the fork crown race is press fit. The cartridges, in turn, slip fit onto the crown race. Tapered contact surfaces between the cartridges and races prevent looseness. Stack height (height of the upper or lower headset outside the head tube) is usually unimportant with threadless headsets, but it may optionally be listed for the upper and lower headset, as follows. The tables below give the dimensions of common headset and steerer sizes, and some which are not so common. SHIS terms are given for threadless headsets, with many more types and sizes, so the codes really matter. It is a Very Bad Idea to install a threadless headset so the handlebar stem is supported by the threads of a threaded fork. The threaded section is not made to resist the stress from the stem and could break off, along with the stem and handlebars. As already mentioned, it is at best risky to try to mix and match parts of a top or bottom headset. Even with the same SHIS code and similar appearance, there is no guarantee that internal parts will fit each other. It is perfectly OK though to use a top and bottom headset of different makes, models and types, as long as the fit to the frame and fork is correct. For example, when replacing a threaded front fork with a threadless one, you could keep the bottom headset, if it fits and is in good condition. 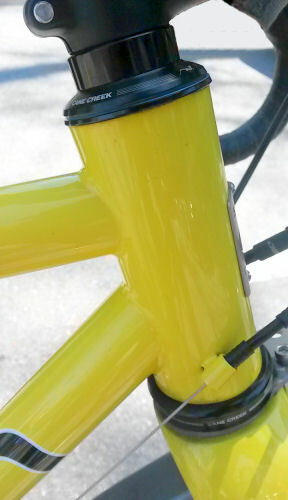 You could cut off the threaded section of a fork steerer to use the fork with a threadless headset on a frame with a short head tube, though the fork's geometry may not produce optimal handling. Shakiness indicates that the headset is adjusted too loose. The easiest way to check for this is to apply the front brake and push the handlebars back and forth, front to back. If you feel a "clunk" it usually means the headset is too loose. You can determine that the looseness is in the headset and not the brake by resting a finger across the gap between the races of the top or bottom headset assembly. If the bicycle is in the work stand with the front wheel off, you can just push and pull on the forkends. Stiffness results when the headset is adjusted too tight. Check for this by lifting the front of the frame so that the front wheel comes off the ground. Normally, the wheel and handlebar will flop to one side or the other by their own weight when you do this. If the front wheel and handlebars are off the bicycle and you turn the fork, you may feel a light, smooth, even drag from bearing seals -- this is normal. Roughness or uneven drag indicates problems. The fork steerer may have been bent in a crash. Generally, this is not repairable, and you need to replace the fork. One or more of the bearing races may be installed slightly crooked. This usually is fixable by having the frame's head tube and the fork's crown machined or "faced" to ensure that the races install with correct alignment. This requires expensive special tools that only better bike shops have. One or more of the bearing races may be loose where they attach to the frame/fork -- or a cartridge bearing may not seat tightly against a race. This will cause looseness as the race wiggles back and forth, even though the bearings may have been tightened up sufficiently to eliminate bearing play. The fork crown race most often gives this problem. If the crown race is loose, sometimes you can fix it by using a hammer and centerpunch to create a series of "craters" in the side of the surface that locates the crown race. The raised edges of the craters may be just enough to remove the slop. Or, better, you may go to a different size headset. In particular, if you are working with a J.I.S. frame and fork, they can be re-machined to work with an ISO headset. Since ISO. head tube races are larger, and crown races are smaller, there is material available to be machined away to convert to ISO. You might also use "plastic steel" (epoxy glue with a filler of steel particles, available at hardware stores) to build up the space between a bearing race and its seat. Be sure to clean off the excess, so steel particles don't get into the bearing. Assemble and adjust the headset before the epoxy sets, so the races will seat fully. Threadlock compound may also work. You may have installed a bearing retainer upside down. This is not uncommon. There is no real standardization as to which way the retainer faces, so it's easy to err. However, if you take a careful look at the races of your particular headset, you will see that if you install the retainer upside down, the retainer can come into contact with one of the races. Just flip it over. The retainer must not be in contact with anything but the bearing balls. If the headset uses loose bearing balls, there may be too many, so they jam against each other. Or a bearing ball or balls may have moved out of line during installation, so it is rubbing rather than rolling. As already mentioned, it's OK to replace only the bottom or top parts of the headset as a unit, but the two bearing races at the top, and the two at the bottom must match, and the bearing balls and retainer (or cartridge) need to be the right size, or else all bets are off. All of the other ball bearings on a bike spend their lives rotating round and round, but headsets spend most of their time pointing straight ahead. Sometimes you will see that the bearing balls have created a neat row of little dents in the bearing surface of the lower frame cup and/or the crown race. This creates the effect commonly known as "indexed steering" where the balls sort of "snap" into place, and the fork tends to stick in the straight-forward position. The dents in the races resemble the dents created by the Brinell hardness test procedure, and as a result, this type of damage is sometimes called "Brinelling." This is a bit of a misnomer, because the Brinell hardness test involves basically hammering a bearing ball into a metal sample with one good hard whack. Some folks assume that the dents in headset races also result from impact, but actually that is not commonly the case. Instead, it has to do with lubricant breakdown. Jobst Brandt has an article on this site describing the process in detail. Ideally, a "Brinelled" headset should be replaced, but you can often cure the problem by replacing the retainer with loose balls. You use the same size balls, but can usually fit more of them into the races if you leave the retainer out. As a result, the greater number of balls, closer together, no longer all line up with the dimples in the races. 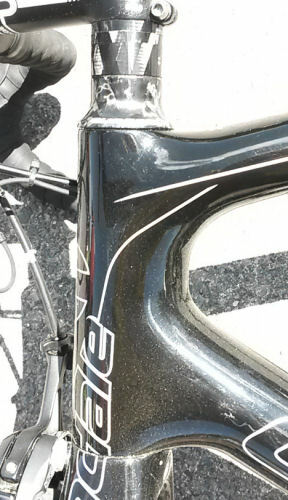 A headset race can, on the other hand, become indented due to overload in a crash. The dents then will be deeper in the part of the race that took the impact. Usually, in this case, the fork will be bent too. The indented race(s) and the fork need to be replaced. Keyed washer and lock nut, for threaded headsets. Adjustment is easiest if you use two wrenches. You may use large end wrenches, or special wrenches made to fit the wrench flats of the locknut and top race -- but in a pinch, you can get by with a single large adjustable wrench. There is some risk of stripping out the tab of the keyed washer or of its damaging the threads of the steerer if you use a single wrench. Leave the bicycle right-side-up with the front wheel resting on the floor. Loosen the locknut. Preferably, hold the top race from turning with one wrench while turning the locknut with another. If using one wrench and the top race starts to turn along with the locknut more than a tiny bit, go looking for a second wrench. (Skip this step if threads and washer are greased.) Unless the threads and keyed washer are already greased, remove the locknut and keyed washer. Do not unscrew the top race, unless you are going to go on to overhaul the headset -- loose bearing balls might fall out. (Skip this step if threads and washer are greased.) Grease the keyed washer and the threads of the steerer. (Skip this step if threads and washer are greased.) Replace the keyed washer, and screw the locknut down most of the way, leaving it loose.. Tighten the locknut lightly and test the bearings for free rotation with no excess play. Unless the adjustment is perfect, loosen the locknut and readjust the bearings as necessary. When the adjustment is correct, tighten the locknut fully and check again. Older French threaded headsets use a serrated or pinned keyed washer which mates with the upper head race. With these headsets, you must back off the locknut farther so that you can rotate the upper head race. "Aheadset" style threadless headsets, the most common type, require a threaded fastener such as a Star Fangled Nut (photo at right) to be installed inside the steerer. This type of headset must be used with a special handlebar stem that clamps onto the outside of the steerer, either with one or more binder bolts, or other means. 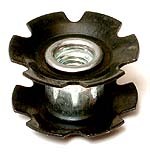 The stem is further secured by a plastic or metal cap which is bolted to the star nut. To adjust an "Aheadset"-type headset, the stem binder must be loosened, then the bolt that runs through the cap to the star nut is tightened, usually with a 5 mm Allen wrench. This presses the stem down against the tapered bushing that fits inside the adjustable cup, and takes up the slack in the system. The stem is then aligned with the front wheel and tightened with its binder bolts. Once the stem binder bolts have been tightened, the adjusting bolt that goes to the star nut is under no significant stress, and may even be removed. This makes some unusual customizations possible, for example, adding a wedge/expander-type stem to hold a second set of handlebars! Some "Diatech" headsets from Dia Compe and some Aheadset models use a special pair of collars, usually mounted just below the stem and above the top race. The lower collar has a beveled, conical top surface, which fits inside of a matching bevel on the inner circumference of the upper collar. The handlebar stem is clamped tightly to the steerer, preventing the upper collar from moving upward. As the upper collar is compressed by the binder bolt, it squeezes the lower collar downward, taking up any slack in the headset bearings. The YST "GeForce" headset, unfortunately no longer made, has a collar which slips over the steerer, clamped to it with a binder bolt. The outside of this collar is threaded, and the upper bearing race screws onto these threads. The assembly is fitted with a binder bolt that clamps it tight onto these threads when the desired adjustment has been attained. The GeForce is the only threadless headset which doesn't use the handlebar stem as part of the adjustment. This headset could be used with any stem, either external clamping or internal expander/wedge type. It is commonly found on Bike Friday folding bicycles made in the mid-1990s. To adjust a GeForce headset, loosen the binder bolts in the collar and the top race; screw the collar and upper bearing race together, then back off by a fraction of a turn. Tighten the binder bolt of the collar while pressing the assembly down; turn the top race to adjust it; then tighten the binder bolt of the top race. The collar uses a 4 mm Allen wrench, and the top race, a 2.5 mm Allen wrench -- available at some bike shops and at better hardware and auto parts stores. You might take the collar/upper bearing race assembly with you to check the fit of this wrench when you buy it. Headsets are pretty durable, and hardly ever need to be serviced if your bicycle has a front fender. To overhaul a headset, you first have to remove the stem. It usually also makes things easier if you remove the front fender, wheel and brake, or at least disconnect the front brake cable. If you have a cyclecomputer pickup mounted on the fork, you'll also need to remove one end or the other of the computer wiring. It helps also to turn the bike upside down once the stem has been removed -- easier with a workstand. Don't rest old upward-arched drop-bar brake cables on the floor. Unscrew the lock nut, remove any washers, then unscrew the threaded bearing race. You'll be able to just lift the fork out of the frame. Once the stem is off, all of the spacer washers should come off easily. The upper bearing race may be a snug fit to the steerer, so you might need to give the top of the steerer a rap with a mallet to break it free. Once you have the fork out of the frame, you can see what kind of bearings the headset uses. The illustrations below show the assembly order for typical headsets with different types of bearings. A headset may or may not have contact-type seals as shown under the lower bearing of the headset at the left. An integrated (IS) threadless headset with cartridge bearings does not have head-tube races, but instead, the cartridges install directly into recesses in the head tube of the frame. 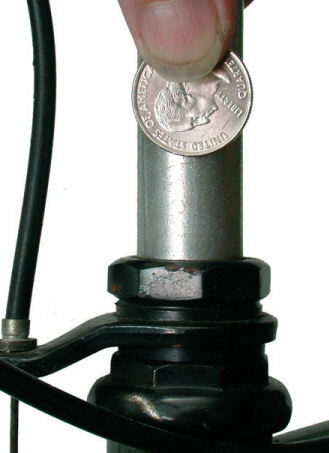 This threaded headset has bearing balls in cages (retainers), though generic loose bearing balls can be installed as replacements in most headsets which were supplied originally with retainers. This threadless headset has cartridge bearings. Only exact replacement cartridges will work. Cartridge bearings are mostly to be found in newer, threadless headsets. Once you have removed the fork, you can check the condition of cartridge bearings by turning them with your fingers. They should turn smoothly, though there will usually be some drag from bearing seals. Exact replacement is needed with cartridge bearings -- or else, replace the entire headset. After cleaning a headset that uses retainers or loose bearing balls, check the bearing races for indentations and pitting. If the headset uses bearing balls held in retainers, you could re-use them if they are still in good condition too. There's little standardization among different makes/models of headsets, so finding a replacement retainer may be difficult or impossible. The top and bottom retainer are usually identical, and exchanging them will increase wear life. It may be possible to pop the old bearing balls out of a retainer and insert new ones, taking care not to bend the retainer. You can increase the load capacity and wear life by replacing retainers (especially the bottom one) with loose bearing balls, though in some cases it's difficult to keep loose balls in place during reassembly. If the headset had loose bearing balls, replace them...they're cheap enough! You very likely lost some anyway when you disassembled the headset. Most headsets use either the 5/32" or 3/16" size. For re-assembly, it is very helpful to have the bike mounted upside down in a workstand. If you lower the steerer partway into the head tube, you will be able to load up the bottom (but facing upward) head tube race with bearing balls without worrying about having them fall down through the head tube, because the steerer will fill the gap. Use enough grease to hold the bearing balls in place. Leave the race one ball short of full, so the balls won't jam up against each other when you reassemble the headset. Once all the bearing balls are in place, add lots more grease, to help seal out dirt when the bicycle is in use. Once the balls are in place for the lower part of the headset, you can drop the fork down the rest of the way into the headset. Grease the inside of the upper race, and get it started onto the steerer. Load it up with balls, add more grease, then slide (threadless) or screw (threaded) it "up" to take up most of the slack in the system, so the balls can't fall out. For a threaded system, you can then turn the bike right-side up to complete assembly/adjustment and wipe off the excess grease. For a threadless system, you need to secure the fork before turning the bike right-side up. I sometimes use an old toe strap for this, tying the fork crown to the down tube of the frame. Removing and re-installing the headset bearing races is not necessary for a normal overhaul, only when you are replacing the headset or installing a new fork. If you are working with an inexpensive all-steel headset, you can often manage with basic hand tools, but if your headset has aluminum or plastic parts, you really need specialized tools made for the purpose. These tools are generally not economical for a home mechanic to purchase, given how rarely they are likely to be used. The races can usually be removed with a hammer and an old flat-blade screwdriver that you don't care about. The head tube races usually come out pretty easily if you stick the old screwdriver down into the head tube until it hits the internal edge of the race. Tap gently once, then move the screwdriver to the opposite side of the head tube. Keep going back and forth every other blow, so that you won't be driving the race out crooked, which could damage the head tube. The fork crown race is sometimes more challenging, depending on the construction of the fork crown and the width of the race. You may or may not be able to get a good purchase on the underside of the race. If the race has a good overhang on both sides of the fork crown, a bench vise is often best for this. Open the vise just wide enough to permit the fork crown to fit through loosely, so that the crown race is sitting on top of the vise jaws. Use a mallet to rap on the top of the steerer, driving the fork down and away from the race. It is a good idea to thread the headset locknut onto the steerer before doing this, to prevent damage to the threads of the steerer. Alternatively, a bicycle workstand can be used to clamp the steerer with the fork upside down. You can use the hammer and old screwdriver to drive off the race. Some races and some fork crowns give very little to grab onto. There are special shop tools to work around this problem, so you might want to just bring the fork into your local shop and have it remove the race. Press-fit races need to be seated firmly. The head tube races can be tapped into place with a mallet and a block of soft wood that spreads the impact all the way around the margin. Use another block of wood to support the other end of the head tube, and be sure it's sitting level so you don't damage it. Bike shops have threaded tools to pull the races into place. The fork crown race is more difficult to seat. You can tap on one side and the other, inboard next to the steerer with your old screwdriver, or you may tap on a length of pipe that just fits over the steerer. Turn the pipe around as you tap, in case the surface which rests against the crown race isn't perfectly level. If you don't get the races firmly seated, they will seat themselves during riding, and the headset will loosen. It then only needs to be readjusted. If working on someone else's bicycle, you should be sure to get the races seated fully before delivering it. If you don't have special tools, you could go for a short, bumpy ride to seat the races, then readjust the headset. Also see my Adventure Cyclist article about headsets.